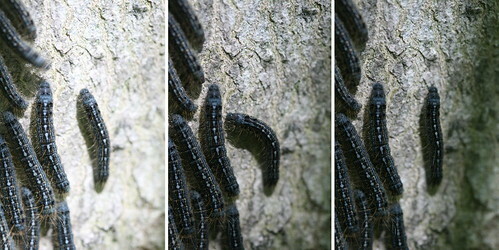 Heading down to the dock this afternoon I noticed this large aggregation of caterpillars on the trunk of a relatively young tree. 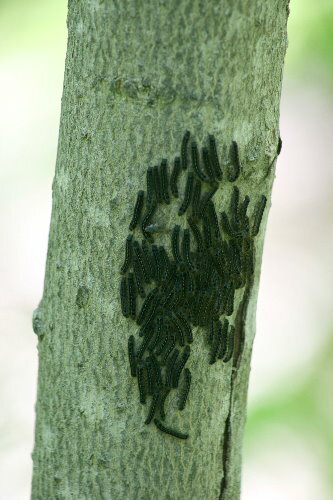 The caterpillars are Forest Tent Caterpillars, Malacosoma disstria, related to the Eastern Tent Caterpillars, Malacosoma americanum, that are the stereotypical tent-builders commonly associated with the name. Whereas Easterns tend to be found in more open areas, associated with successional species such as chokecherries, crabapples, apples, Black Cherry, and other members of that family, Forests, as the name implies, are found in more mature growth, and are generally associated with maples, basswood, oak, and other forest trees. The caterpillars are easily told apart by the pale line down their back, which is solid in Easterns and broken in Forests. But perhaps the most distinct difference is that Easterns build large tents to live in, while Forests do not; they will congregate together on leaves or trunks, and they leave silk trails along their foraging routes, just as Easterns do, but they don’t build complex silk structures (though they may weave a silken mat that they sit on). This makes them something of a sitting duck (or ducks), exposed out in the open. The Easterns can retreat into their nest, and spend their non-foraging time under the protective layers of the silk, but the Forests don’t have that option. 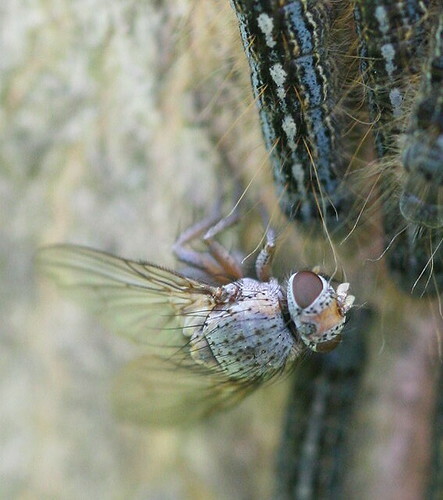 There’s not much they can do about predation from birds or the like (although I don’t know about the presence of urcticating hairs or unpalatable taste), but they have evolved a mechanism to protect themselves from parasitic flies. Last spring I discovered a caterpillar with a fly egg behind its head. These larvae, when they hatch, burrow into the caterpillar and feed off it from the inside (without killing it right away). The flies lay their egg at the back of the head where the caterpillar can’t remove it. To say that the caterpillar “wants” to avoid being laid on is an understatement, and so they have evolved to twitch their front ends rapidly from side to side when there’s a threat. I caught these ones twitching; the photos were taken at 3 frames per second (so the above series represents one second). It was only after I’d run off a series of photos of the twitching caterpillars that I happened to notice the fly, though she’s there in that top photo, too, if you look carefully (it would have to be a she if it were laying eggs). It was wandering along the edge of the caterpillar colony, and the caterpillars were all freaked out, twitching back and forth like mad. Surprisingly, though, only about half of them were doing this, the other half were just sitting still. Perhaps saving their energy, since the fly wasn’t actually targeting them? 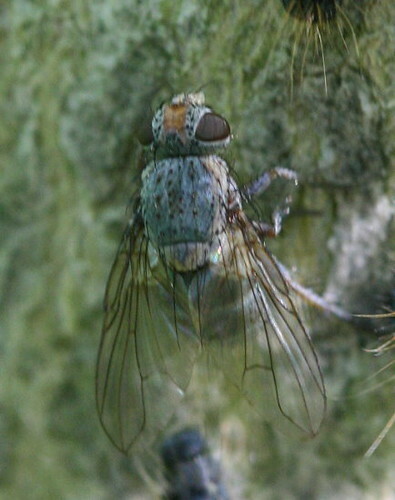 There is a particular species of fly that specifically targets Forest Tents: Sarcophaga aldrichi, often called the Friendly Fly for its habit of landing on people without biting (probably interested in the salt in your sweat). Friendly Flies are the number one form of population control for Forest Tents, and their numbers fluctuate in sync with the caterpillars’. 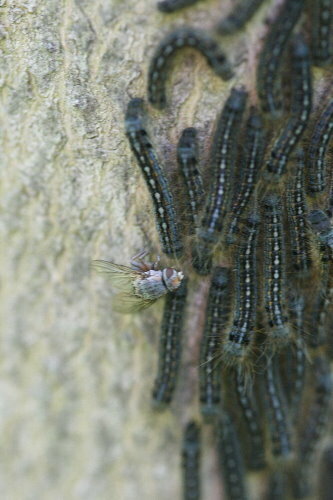 In years of high numbers of caterpillars, the Friendly Flies will be abundant, and some people have given them the name Government Fly on the (erroneous) assumption that the government had released the flies to control the caterpillars. It would logically make sense that this fly wandering about a Forest Tent colony and freaking all the caterpillars out would be a Friendly Fly, except that it doesn’t match any of the photos I’ve found of that species. Flies are one of those groups that really throw me for a loop when trying to figure out an identification, so I can’t even place it in a family reliably. 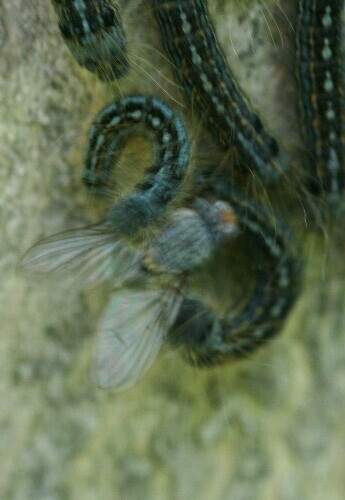 I’ve submitted the photos to BugGuide.net and am waiting to see if someone there is able to ID it. At one point the fly got a little too close to a couple of very upset caterpillars, and they turned on it, appearing to bite at it. The fly squirmed through their attack and moved away. I didn’t see it make any moves to deposit an egg on a host while I was there, it mostly stuck to the edges of the colony. I finally accidentally disturbed it and caused it to fly away as I was trying to brace my hand on the tree trunk to support my somewhat heavy camera/lens combination (it didn’t help that it was very windy out today). Considering how flighty most flies are, though, this one was fairly docile. I’ll have to keep an eye on that tent caterpillar colony over the next few days, and see whether the fly either returns, or I notice any caterpillars carrying little white spheres behind their heads. It’s interesting just to encounter a particular species and to know something about their life history, but it’s even cooler to come across a behaviour or species interaction like this. Now I’m looking over the fly’s wings for caterpillar bites. I was thinking the same thing: a friendly fly doesn’t look anything like that (friendly flies generally look like giant house flies). I’m very curious as to this species and what it was doing–if anything–to or with the caterpillars.